What did you want to achieve with Release? 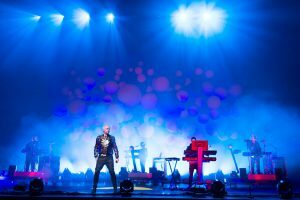 Neil Tennant: We made a decision to try to do songs that were just aimed at sort of a dance audience. Dance is so big nowadays, and when we started, in the ’80s, dance was more of an underground thing. but nowadays we think our strength is as songwriters, and it was more original and interesting to put together a set of songs that really had a lot of feeling and a lot of meaning. The album is really divided between personal songs and songs that are just stories, inspired by contemporary events that are in the press and the media. Like the [former Northern Ireland secretary Peter] Mandelson song [I Get Along]? Tennant: Yeah, we saw the film clip of it. He seemed to be listening really carefully, and when the line says your name isn’t Stan is it, he [Dre] says what the f**k is this? [laughs] so he’s aware. It was the Elton John/Grammys duet that inspired the whole thing, because Eminem’s sense is that he’s not homophobic, he’s just representing a point of view in America. I just thought we’d take it and make something sweeter of it and this song [The Night I Fell In Love] has a kind of romantic glow about it. This gay boy goes to a concert of this rapper and the surprise is how nice the rapper is, and how unlike his image, and the boy can’t believe it’s happened [in the song, the boy ends up sleeping with the closeted gay rapper]. It’s really sort of sweet. I wanted to give that kind of context, rather than the kind of vicious context it’s been getting. There’s been this huge pop explosion in the last few years. Where do you feel you fit in? Speaking of Closer To Heaven [the West End, London musical for which they wrote the music last year], are there plans to bring it to the US? Tennant: There are! We just had a meeting about it yesterday, in New York. We have plans to bring it there next spring, in a new production. I’ll believe it when I see it. The theatre moves very, very slowly. But it’s exciting. You’ve both worked with so many different kinds of artists over the years [Dusty Springfield, Boy George, Liza Minnelli, Electronic, etc]. In terms of collaborations, do you feel like it adds to what you can produce, or is it sometimes distracting? Tennant: No, from doing different things you learn a lot, you learn all sorts of different techniques, and get different ideas. For example, from working with Dusty Springfield [What Have I Done To Deserve This? 1987], I learned an awful lot about singing, because we were producing her vocals. That was a real privilege, firstly to produce vocals like Dusty Springfield, and to see how she creates a song, changes a verse, a chord. I certainly learned a lot from her. Before that, I just sang whatever came out of my mouth! A lot of people are saying this is one of the most accessible of all your albums, and I think that’s reflected in what you’re saying. Tennant: I think it is, and also – we really chose the songs very carefully. Since the CD was invented, albums have got longer and longer. People have stopped editing. And you’ve got albums that are 16 or 17 tracks! And you never get to the end. With this album, it lasts 45 minutes – it’s a vinyl length album, and I think if you want to, you can easily get to know it. It’s all linked together, and there’s definitely a feeling there. And it all sort of ends on a rather philosophical note, with the song You Choose, which we wrote in an unusual way. I just sat down and wrote the lyrics while I was on holiday, thinking about my own experiences, and then I gave it to Chris. It was sort of like Elton John and Bernie Taupin. I just gave him the lyrics and I went off for a run, and I came back and he’d written the music. It was so not what I’d imagined  the song had been kind of jazzy. It was a really interesting way of working. In the US, the albums being released by Sanctuary, which is a first for you. How did you decide these were the people to release this record? The reviews of the record have been great, and Pet Shop Boys is headed out on tour in a couple of weeks. Have you something different planned for this time? Tennant: This time, it’s really different. We’re representing ourselves as musicians. I recently started to think that people never regarded the Pet Shop Boys as being musicians, because we never take credit for anything. On our album credits, we always credit everyone else when in fact we’ve done most of it. On this album, our starting point was to play everything ourselves, although at the end we brought in [former Smiths guitarist] Johnny Marr to play guitar. Which is maybe some of where the rock sounds come from? I mean, you’ve got to change your sound.